Today I am so happy that I have a good game in front of me which is Eternium by Making Fun Inc. After my last review, I was so shocked that I lost my will to play anything. But today my faith in the mobile RPG has returned. I am presenting to you this great game which is like Diablo or Path of Exile phone edition. So let`s see what we have got here. You run around killing skeletons, zombies, ghosts, and demons, all while amassing a hoard of gold and gear. The mindless wandering around killing things is probably one of the most therapeutic means of killing time I’ve experienced since World of Warcraft. 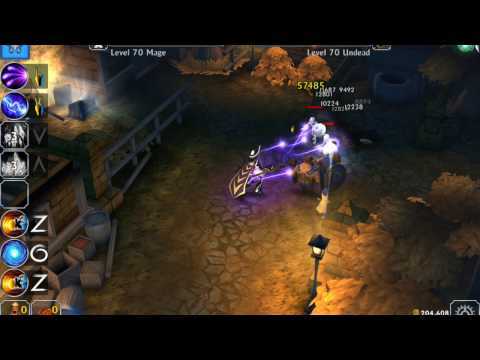 Eternium is a free to play action RPG that is inspired by classic games such as Torchlight and Diablo. It launched way back in 2014 and is still receiving new updates and features. Developed and published by a small group of old-school RPG fans. One of the best features of this game is the incredible way of controlling the character and his skills. I will be honest and tell you that this game is so great and unique because it is really hard to create something like Diablo on a phone or tablet without losing the incredible feeling and tension. You might be wondering, “how in the world do you play something like Diablo on a phone or tablet?” Well, Eternium: Mage and Minions has a surprisingly simple solution. You use skills by drawing simple shapes on the screen with your fingers, such as an arrow, a circle or a “Z.” The feels more immersive than you might expect because of this “rune” system. Aside from murdering waves of skeletons, one of the most addictive parts of Eternium is the loot. The gear that you pick up and equip shows on your avatar. This gives a nice dopamine shot as you slowly deck her out. The graphics are decent for a mobile game – semi-realistic, but with some cartoon flair – which makes the slow progression of cooler and cooler gear that much cooler. Great story, maps, and enemies. Great loot/drop system with a lot of equipment. Maybe there is some room for improvement when we are talking about the skill tree and stats placement. It is OK, but one detailed screen can give a hero feeling. Great RGP! This is a great model for how a real RPG should look like.